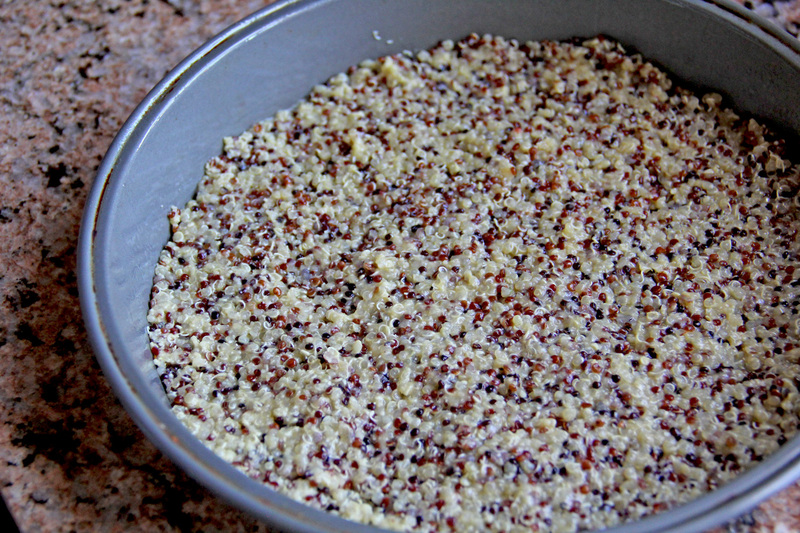 Ever made a “crust” with quinoa? I hadn’t, but decided to give it a try the other weekend and was surprisingly impressed with the results. 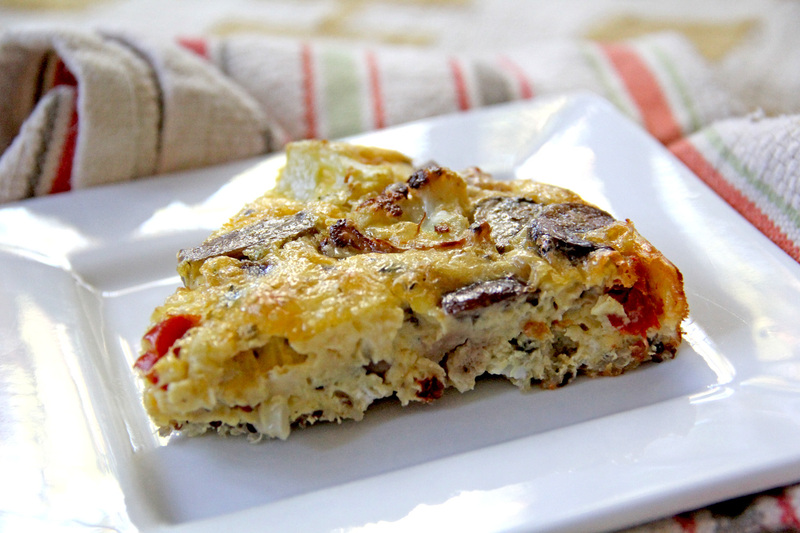 This crust is perfect for those who love the taste of quiches and frittatas, but can’t handle the gluten or want something a little bit lighter with an extra protein punch. And more importantly, it was super, super easy. 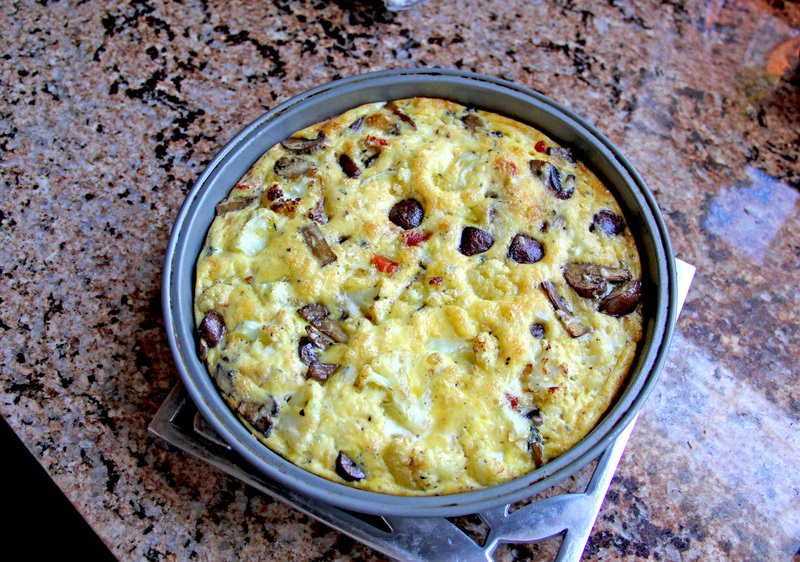 I was originally going to make a quiche with a crust up the sides, but since I couldn’t find a proper pie pan I used a round cake pan and simply spread the “crust” on the bottom, hence the frittata. 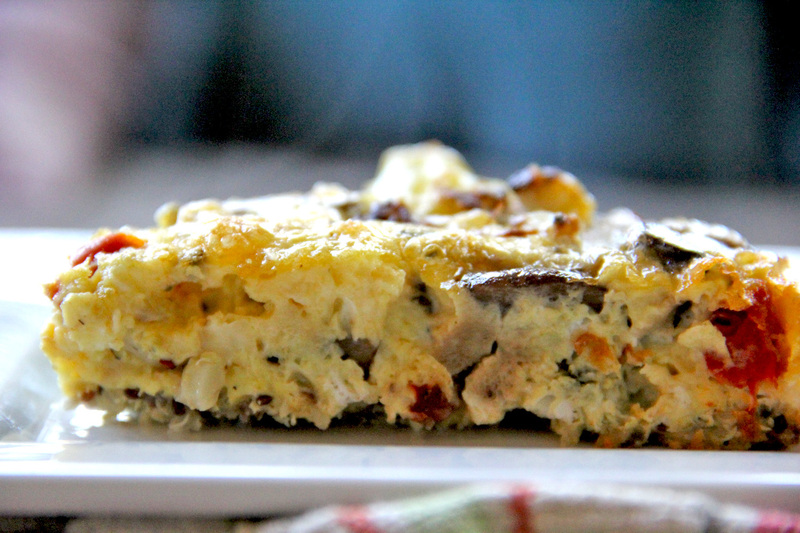 This makes a wonderful quick dinner, lunch or even breakfast depending on your fillings. I went for roasted cauliflower, mushrooms, sun-dried tomatoes and a mix of fontina, gruyere and parmesan cheese which felt appropriate for fall. 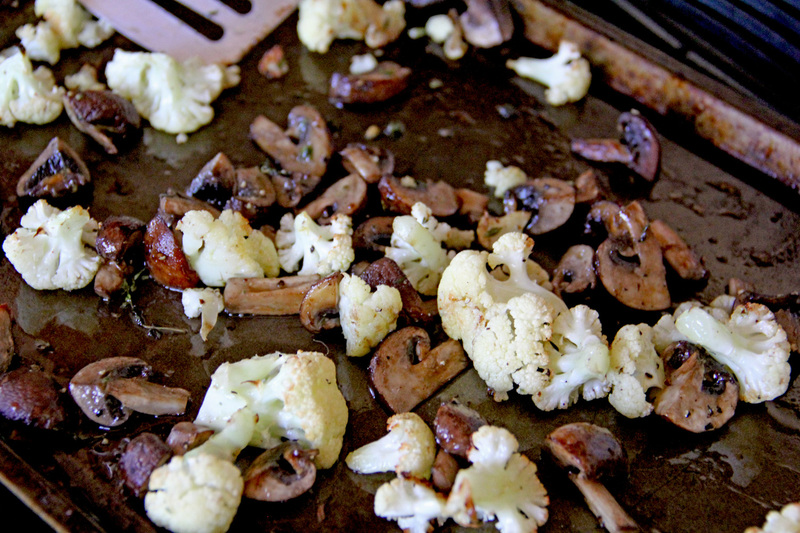 The flavor combination was perfect and roasting the veggies brings out the meaty flavor of the mushrooms and the mild brocolli flavor of the cauliflower. I don’t usually cook with cauliflower, but love it roasted so figured this would be a great place to incorporate it. First, I started on the quinoa crust. Like I said, this was super easy and I was thrilled with how it turned out. Will definitely keep it in my arsenal for future recipes. Cook quinoa in one cup of water. Once it begins to boil, lower the heat, cover and cook for about 15 minutes or until all the water is cooked out. Take off the stovetop, put in a bowl and let rest until somewhat cool. Once cool, mix quinoa, egg and 1/4 cup of parmesan cheese. Thoroughly incorporate everything and press into the bottom of a pie or cake pan. Bake for 10 minutes at 375 degrees until ever so lightly browned. Let sit until ready to assemble. 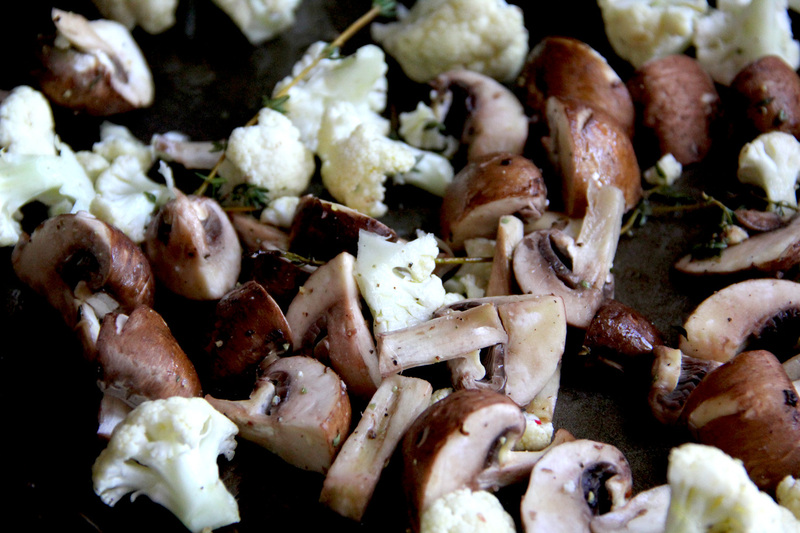 While the crust is cooking, clean and chop your mushrooms and cauliflower into decent sized chunks. You don’t want to go too small as you’ll be roasting them and don’t want a burnt mess in your oven. Drizzle with splashes of olive oil, salt, pepper and fresh thyme. After your crust is done, raise the oven temp to 400 degrees and pop your veggies in the oven for 20-30 minutes until caramelized and golden. Yum! 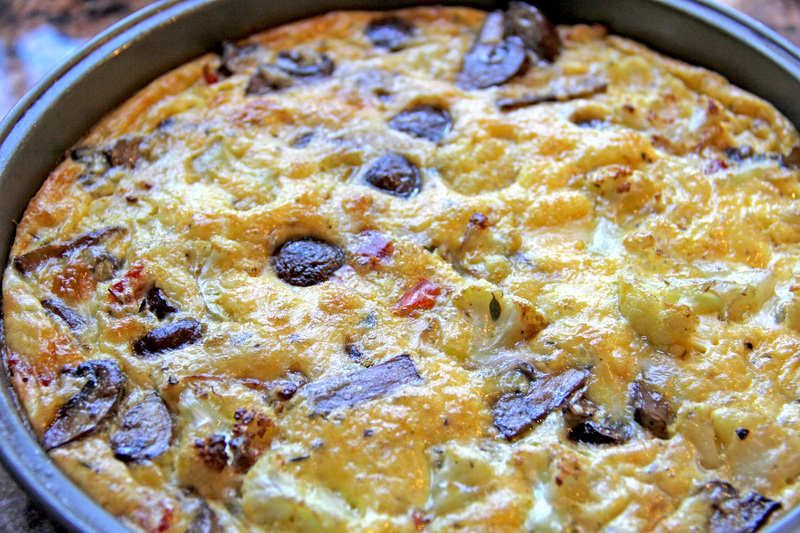 While veggies are cooking beat up the eggs, cheese, sun-dried tomatoes and milk that will make up the bulk of the filling. Add some salt and pepper to your liking and let rest. Now it’s assembly time. Scatter roasted veggies on top of your quinoa crust, top with the egg mixture and pop into your oven for 30-35 minutes at 375 degrees. Bake until lightly browned on top. I would definitely suggest inserting a knife a few minutes before finished to check on the consistency of the cooking egg mixture. You don’t want to overcook it as it will continue to cook a bit as it cools. Once cool, cut into slices and dig in. I really loved the flavor combination. It was mild but still pungent with the sun-dried tomatoes and cheese. It was super filling due to the eggs AND quinoa so if looking for a protein packed meal, look no further! I could see somehow creating a sweet quinoa recipe for baked recipes. Hmmmmm….the wheels in my head are spinning….stayed tuned for that! OMG KRISSY! This looks so Fire! YUM! It was delicious! Try it!